Today I'm honoured to be hosting my very first guest post, written by Artie Van Why. 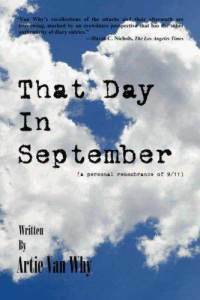 Artie's book, That Day in September, is a memoir about his life before, during, and after September 11th, 2001. It's a beautiful, heartbreaking, moving story about how the events of one day can change your life forever in ways you never thought possible. I posted my review of the book yesterday; I really do encourage you all to read this book, and when you do, to really count your blessings, and to never forget those who were lost or injured on that day in September almost 10 years ago, and also those who are still suffering from invisible wounds. Thank you so much for taking the time to share this with us, Artie! I have wept. I have sobbed. I have expressed the grief I feel. I have gotten lost in mourning. The one constant in all the sorrow and emotion has been the gift of being able to use the written word when I’m unable to speak, or when the weight of my sadness needs to be lessened. The morning after 9/11, I listened to all of the phone messages and read all of the emails sent from friends and family; everyone asking if I was alright. I knew there was no way I could answer everyone individually so I sat at my computer to type an email to send to all those who were reaching out to me in concern. I planned on just a simple email stating that I was “okay”. As I began typing, though, I found myself putting into words just what it was I had experienced the day before. Step by step I took those who cared about me through that awful morning; telling them what I had witnessed; what I had heard; what I had smelled. The words came easily. There was clarity for myself in understanding just what I had lived through, and survived, by putting it down in words. Being able to express myself in written words has been a very important part of living with PTSD. Of course therapy has played a huge part; but writing has been a continued outlet. I don’t take my capability to express myself with written words for granted. I count it a gift. And perhaps the most rewarding aspect has been when a person has told me they’ve been touched by my words. That, through what I have put down on paper, they know, a bit better, what it was like to be in NYC on 9/11. I do believe there is another book to be written; one that will tell the story of recovering from trauma. In “That Day In September” one can certainly draw the conclusion that my life changed forever that day. But I’ve yet to write down the words that will describe the magnitude of that change. Perhaps it’s time to sit back down in front of the computer.